SEOUL, South Korea--(BUSINESS WIRE)--Rsupport (www.rsupport.com) (KOSDAQ:131370), a remote support and control solution provider for global cloud service, announced update of Mobizen, its mobile recording app, to ver. 3.0. This update takes aim at fast-growing one-person media environment. Mobizen ver. 3.0 makes it easier to broadcast contents from a mobile device. 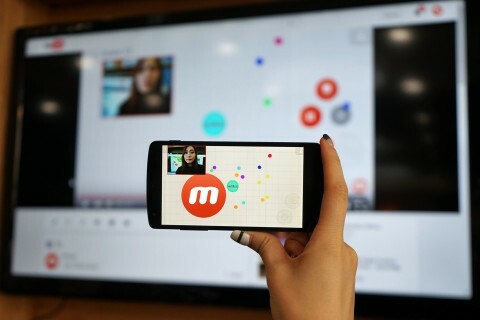 With the Mobizen’s PIP (Picture In Picture) function, users can easily record and edit a content with their face on the mobile screen, and upload the content on any online channel such as YouTube for broadcasting. One of the remarkable changes is the enhanced recording function. The app provides the recording wizard which sets the optimum resolution for various mobile devices, including smartphone and tablet. Other notable changes include the Watermark removal function which eliminates the Mobizen logo from the images, the Countdown function which enables starting of recording in 3~10 seconds, and the Direct Replay function which replays video contents without additional operation. These changes of Mobizen were based on the analysis of users. 95% of the Mobizen users mainly use the recording function and over 30% are Monthly Active Users. More than 0.9 million video contents are created by using Mobizen. In order for easy and fast recording, Rsupport concentrated in optimization of recording function to users’ mobile environment and implementation of the content creating tools, as well as improvement of UI/UX. Mobizen is popular among global users as it supports recording without looting in the mobile devices with Android 4.2 (Jelly Bean) or later version. Rsupport conducted a global update accordingly. It supports 12 languages. New Mobizen Ver. 3.0 is available to download from Google Play (https://goo.gl/gL9w1D) or the website (www.mobizen.com). Rsupport is global cloud service provider having the top market share in Korea and the rest of Asia in the remote support and control field. Among the products of Rsupport are RemoteCall (www.remotecall.com), a remote support solution for B2B business clients, and RemoteView (www.rview.com), a remote control solution for business and individual clients. Rsupport provides Mobizen, a B2C recording solution. The company founded a subsidiary company GameDuck in September last year to provide a game social media service specialized for game recording. Rsupport released Mobizen Ver. 3.0 App for smartphone video recording and broadcasting. Recording within a second, simple using without log-in, PIP for user face while recording, easy video edit, etc.